Facts about Pug Dogs, "Scientific name for Pug Dog, or domestic canine, is Canis lupus familiaris". This charismatic little dog has been nicknamed “Dutch Mastiff” and is an instantly recognizable breed for its distinctive characteristics. The Pug Dog has a wrinkly face, deeply wrinkled around the black muzzle, cheeks, forehead and ears. Pug Dogs will have a compact and square body with a barrel chest and short legs. Pug Dogs coat is usually black and/or fawn colored and short and smooth. Pug Dogs body shape is compact and square. Pug Dogs sweat glands are between their paw pads. It is a Fact a Pug Dog sees in color and have better low light vision. Pug Dogs have three eyelids, a lower lid, an upper eyelid lid and a third lid, that is called a haw or nictitating membrane, this keeps the dogs eye protected and moist. Pug Dogs eyes have a special membrane for seeing better at night, called a tapetum lucidum - a dogs reflective layer in the choroid chiefly of nocturnal, causing the eyes to glow when light at night hits the eyes and they consist of some layers of smooth flat cells covered by a section of double deformed crystals. Pug Dogs are confident, playful and friendly. One minute he is comical and frolicking about but can turn around and be calm and dignified. At times Pug Dogs can be headstrong and stubborn. Pug Dogs may be peaceful and calm with you and then sound off with odd bark when people visit, but snort, snuffle and grunt as they come in. Pug Dogs large expressive eyes and innocent expression along with the cocked head brings out protective feelings in people. The Pug Dog will roll his back legs as he walks, with jaunty strong gait. Pug Dogs are child-like and like to hang around their owners but they can be spoiled. The Pug Dog are sociable with other animals but the Pug Dog can be jealous of if you let another animal rest in your lap. Adult Pug Dogs sleep a great deal of the day away and snore a lot. Housebreaking a pug puppy can be difficult and it won’t like going out in the rain. Sometimes he can be gassy as well. Otherwise pugs tend to be fairly easy to train. Pug Dogs can have problems sometimes because of their flat faces. The Pug Dogs tend to live a long time if cared for well. When it comes to eating, the Pug Dog aren’t very good at stopping when they are full, so it is necessary for owners to monitor the food intake, so that your pet will not become obese. Ribs should barely be visible and the Pug Dog should have a waist, so you will want to adjust how much you give it according to its needs. Upkeep includes keeping nails short, cleaning nose and face rolls and clean its ears with ear wash. Pug Dogs have a lot of teeth and they tend to be crowded so they can be a challenge to brush. Pug Dogs don’t handle the heat very well and need to be cooled off if they are overheating so take care when taking them outside and playing with them in the summertime. Pug Dogs short nose makes it hard to handle heat and humidity. The short face is called brachycephalic syndrome and because of this it can have an elongated soft palate and pinched nostrils. It is possible that your Pug Dog could need surgery if this problem is too severe so take your Pug Dog to the vet if it starts snoring too much or gasping when breathing. Pug Dogs are bred to be house pets and do not handle extremes in temperatures and conditions very well. Pug Dogs have two times the amount of ear muscles than people. It is a fact a Pug Dog can hear a sound at four times the distance of a human. Sound frequency is measured in Hertz (Hz) Def-Hertz is the measurement of frequency, explicitly it's one cycle per second. The higher the Hertz are, the higher the pitched the sound is. Dogs hear best at 45,000 Hz to 65,000 Hz, while humans hear best at around 20 Hz to 20,000 Hz. Pug Dog’s nose prints can be used to identify them, their nose prints are like a humans finger print. It is a Fact a Pug Dog smells more than 1,000 times stronger than that of a human. A Pug Dog’s nose, secretes a thin layer of mucous that helps it absorb scent, after that they lick their noses and sample the scent through their mouth. The number one heath problems amongst Pug Dogs is obesity, so always make sure your Pug Dog doesn't get to fat. Many foot problems that dogs have are just an issue of long toenails. Pug Dogs are sweet companions and can be trained to compete in obedience, tracking and agility sports. The Pug Dog respond best to motivational methods that are positive and encouraging. 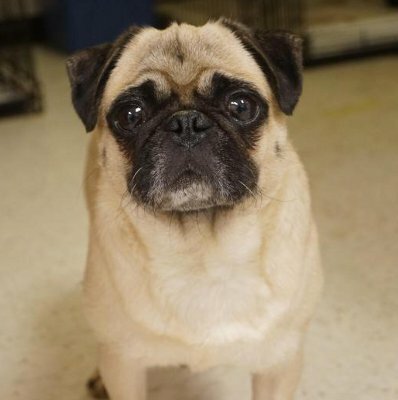 When considering breeding your pet check with the veterinarian to make sure your Pug Dog will pass on desirable characteristics of the breed and not any severe health issues or deformities. The Pug Dog require some babying and some discipline not to be spoiled too much and developed unwanted personality traits. All in all, the Pug Dog are lovely pets and are fun to live with. A Pug Dog’s mouth can apply approximately 150 to 200 pounds of pressure per square inch and an American Pit Bull Terrier, German Shepherd Dog and a rottweiler can have 320 LBS of pressure on avg. All dogs are identical in makeup big or small– 42 permanent teeth and 321 bones. Pug Puppies have 28 teeth and when they become adult Pug Dogs they have 42 teeth. When Pug puppies are born, they have no teeth and are deaf and blind. Pug Puppies for their first few weeks will sleep ninety percent of the day and their vision is not fully developed until after the first month. If purchasing a Pug Dog from a breeder, make sure to find a good breeder with references check at least two to three of the puppies that were purchased from this breeder. The Pug Dogs belongs to the Toy Group and in 1885 it was recognized by the (AKC) American Kennel Club. Pug Dogs pant to keep cool with 10 to 35 breaths per minute with an average of 24 breaths per minute. A large dog breed resting heart beats between 60 to 100 times per minute, and a small dog breed’s heart beats on average between 100 to 140 pant a lot. A Pug Dog is an omnivore, (definition-they eat both other animals and plants). All Dogs are direct descendants of wolves. Female Pug Dogs are in heat for matting for about 20 days twice a year. Female dogs are pregnant for 60 days before they’re puppies are born.